A few years ago I got this ridiculous thing from a thrift store: the Black and Decker “Cordless Broom” (differentiated from regular brooms, which I guess somehow have cords???). 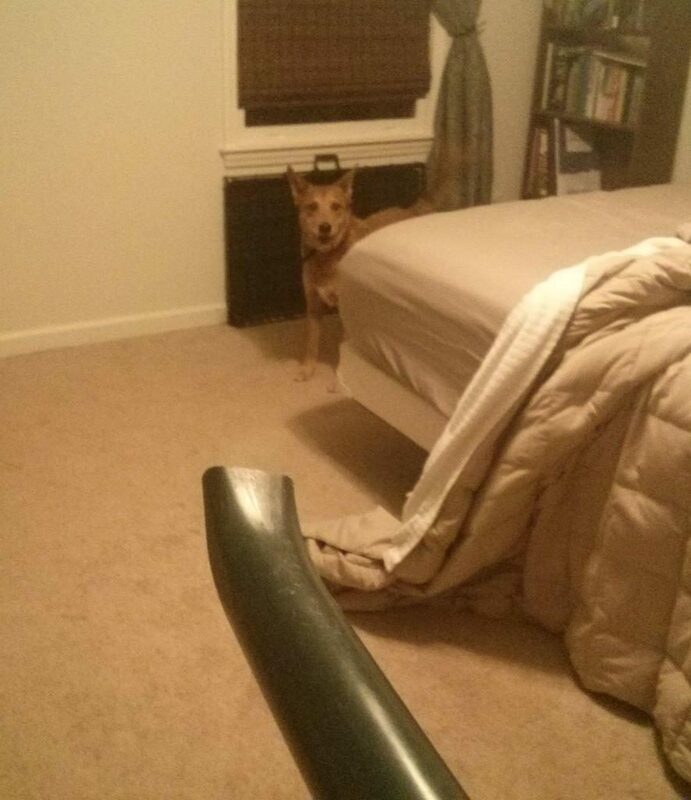 It’s basically a really weak leaf blower, but it looks like a giant bazooka, and it was $5 at the time. 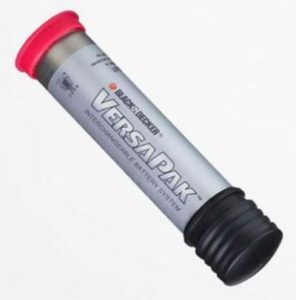 It runs on obsolete “VersaPak” batteries, which were part of a proprietary tool battery system from at least 10 or 15 years ago. I had an old electric screwdriver that ran on one of these around then. 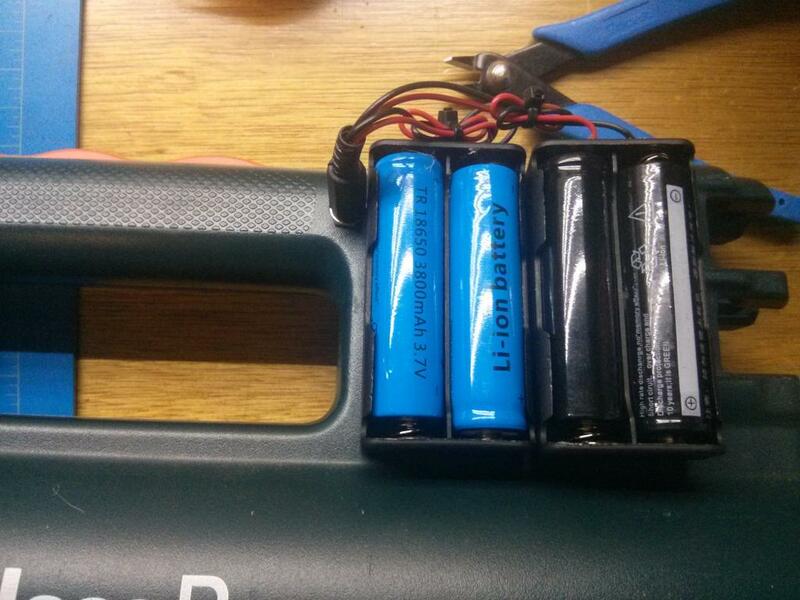 Each battery was a 3.6V NiCd pack, and this unit uses two of them at once to run at 7.2V. I wanted to revive it, but I wasn’t going to be hunting down decade-old batteries on ebay to do so. I decided to use 18650 rechargable Li-ion cells (the same kind used in laptop batteries) because they’re 3.7V each (close to the original’s 3.6V) and I had a bunch lying around. I popped the housing apart, drilled a hole in the side, and added a 2.1×5.5mm panel-mount female DC barrel jack that hooks to where the VersaPaks would connect in. Now I could power it from my bench power supply to verify it worked, and it did. 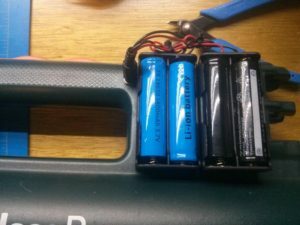 My first attempt at a battery solution was a single pair of 18650 cells in a cheap ebay case. This worked, except the wires that came pre-soldered to the battery case were a very small gauge, and I actually felt these wires heating up when I used it. This was no good – I was a bunch of my power to wire resistance! Also, the thing ran the pair of 18650s down pretty quick. I don’t have any pictures of any of that because I did that part a long time ago, then lost interest. Recently, I felt like doing a little project, and the thing was sitting here, so I finally finished it. I got two new two-cell battery cases, and snipped their tiny pre-soldered wires. I soldered on good 22 AWG wires direct to the outputs, and hot-glued the wires for mechanical strength. I ran both sets of battery pack wires to a single male DC barrel plug, so as to run two pairs in parallel (2S2P in battery-people speak). I screwed the two cases to the housing (there’s plenty of room to screw into where the VersaPaks used to plug in) and plugged it in, and presto. No more warm wires and much better battery life. I like this thing because it can quickly blow sawdust and stuff in the shop without sending screws and heavier stuff flying around. Also, Reginald is terrified of it.